dy/nas/ty • Ebony G. Patterson, a new exhibition, opens Friday, March 7, in the Nerman Museum of Contemporary Art’s second-floor galleries in Kansas, Bruce Hartman reports in gardneredge.com. A reception for the exhibit will was held on March 7, followed by a lecture with artist Ebony G. Patterson in the museum’s Hudson Auditorium. Jamaican-born Patterson’s previous monumental mug-shot portraits have evolved into complex groupings of figures as she furthers her exploration of the appropriation and interpretation of feminine archetypes by young men of the African diaspora. Aspects of the feminine, fashion, pattern, decoration and pastiche proliferate in her large-scale, mixed media works and elaborate installations. Her Nerman Museum show – an encompassing installation – will be her first one-person exhibition at an American museum. 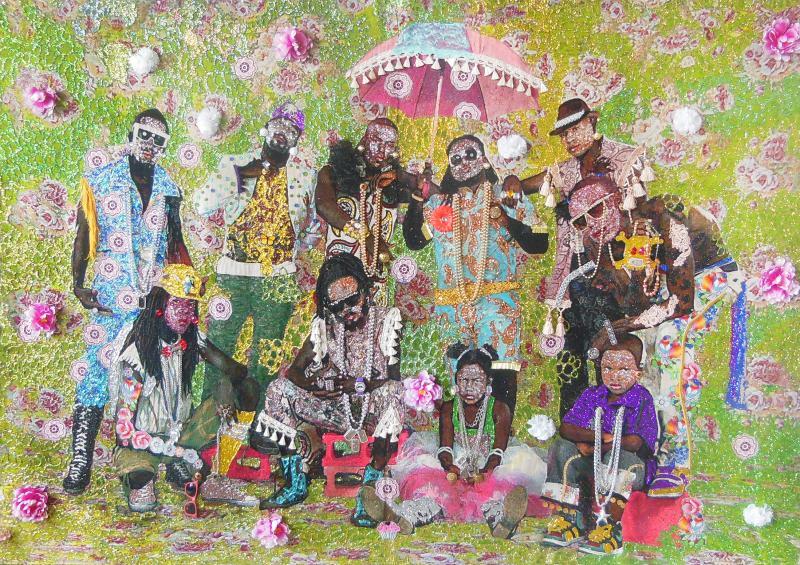 Her monumental tapestries – encrusted with glitter, rhinestones, fabric silk flowers, jewelry, sunglasses, etc. – are both vibrant and inescapable – and grounded in the subcultures of Kingston, Jamaica’s dancehall happenings. Flamboyant and visually assertive, her works investigate shifting and contradictory roles in Jamaican dancehall culture. She explores contemporary notions of fashion and masculine beauty, considering practices like skin bleaching, meticulous grooming and riotously patterned attire – all common within dancehall culture. Patterson’s Fambily series explores the gang as a way to re-envision family and to examine the complicated relations between men in the gang. “The Fambily series, in particular, also explores the gang structure and looks at gang hierarchy. Gang space is also another kind of space where men learn to assert themselves in the macho and is also a space where they want you to understand a certain kind of masculinity,” explains Patterson. Patterson did her undergraduate work at the Edna Manley College for the Visual and Performing Arts in Kingston, Jamaica, and earned her master’s of fine arts in 2006 from the Sam Fox College of Design and Visual Arts at Washington University, St. Louis. Her works have been featured in numerous exhibitions including Caribbean: Crossroads of the World, Perez Art Museum, Miami, El Museo De Barrio, Queens Museum of Art and The Studio Museum in Harlem, NY; eMERGING: Visual Art and Music in a Post-Hip-Hop era, The Museum of Contemporary African Diasporan Arts, Brooklyn, NY; and Monique Meloche Gallery, Chicago. Patterson will participate in Prospect.3, New Orleans, in the summer of 2014, and will be included in the upcoming 2015 Havana Biennale, Havana, Cuba. Patterson is an assistant professor in the painting department at the University of Kentucky, Lexington. dy/nas/ty • Ebony G. Patterson will be on view through Sunday, June 15, 2014. The Nerman Museum is open 10 a.m. to 5 p.m. Tuesday, Wednesday, Thursday and Saturday; 10 a.m. to 9 p.m. Friday and noon to 5 p.m. Sunday. The museum is closed on Mondays and all JCCC holidays. Admissions and parking are free.